For about the last month or two I have been completely obsessed with salads. They have been my go-to dinner and lunch meals because they are SO easy to throw together and they taste amazing. I've been switching between two different types. The first, my version of a Southwest Chipotle Chicken Salad and the second, a salad that Jenny threw together one night. 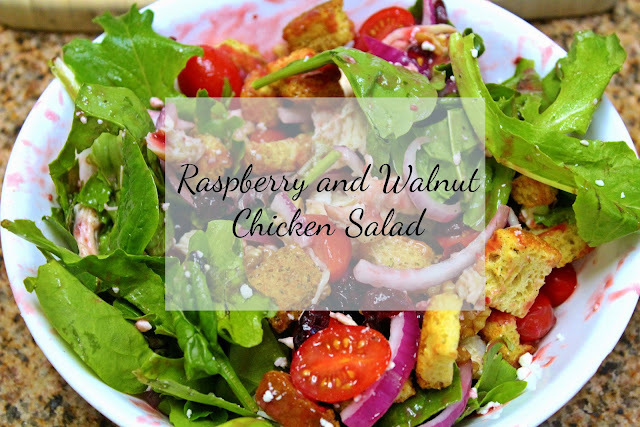 I call it the Raspberry and Walnut Chicken Salad. I actually am kinda of obsessed with the Raspberry and Walnut Chicken salad and have decided to share the super easy recipe with all of you lovelies. The rest is as easy as throwing all the ingratiates into a bowl. I like to layer all the extras on top of the lettuce and them toss it with the dressing before I eat it. Third layer: Tomatoes. My personal favorites are the Cherubs. Holy moly....I can eat these little babies like candy. Delicious. Fourth Layer: Croutons and Raspberry dressing. The other thing I love about this salad is how colorful it is! It's almost too pretty to eat.....almost. What's your favorite salad toppings and dressings? Any recommendations for me? I'm a huge fan of trying new things on my salads! Yum! This looks like a perfect Spring/Summer salad!